Between kids being kids and the weather being, well, unpredictable, playground surfaces can take quite a beating. 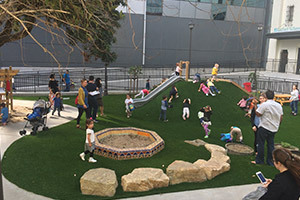 XGrass synthetic turf dramatically decrease the need for ongoing maintenance – while providing the safest possible surface for your new playground. XGrass synthetic playground turf is designed from the ground up for safety. It’s fully certified by the International Play Equipment Manufacturer’s Association (IPEMA). Combined with our exclusive SofPad underlayment and antimicrobial infill, our synthetic turf system is one of the safest play surfaces available today. And with our Heat Block technology it’s cooler, too: up to 17.5°F cooler than other artificial grass systems.